What do your timelines look like? Unfortunately that's an "it depends" answer. I'm pretty specific in track naming most of the time, but, sometimes on something I whip out very quickly as a one-time thing, my timeline is sloppy. For complex work I tend to start in a single comp sjot, but as things progress I'll start splitting off groups of layers into embedded composite shots and proxy them, but, again, it always depends on the project. Using, say the "Essential Hitfilm" titles as an example, the entire animation was built in a single composite. In its current state the background animation (the Hitfilm logos and mortarboard, particles, etc) is a proxied Composite. Which HFE2017 was released, I needed to refine that. But there are lots of embedded comps as each Hitfilm badge is synchronized to a Height Map version for Caustics. The "Hitfilm University" animation is it's own embedded comp. The "Episode Title" is its own embedded comp, with a 'Text Holder" embedded inside it. Other than the episode title. All these embedded comps are proxied. 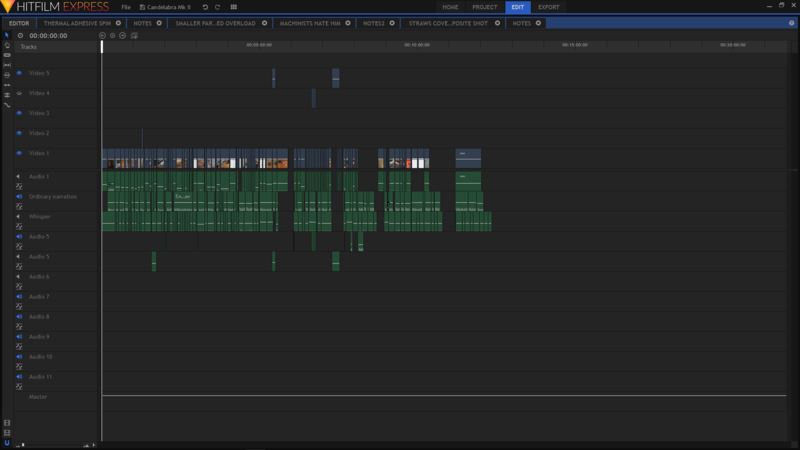 For a new episode I just change the text holder, save the project and export the Editor Timeline. I've done it this way, because, eventually, there will be the "Mastering Hitfilm" series. I'll just duplicate the Essential comp, change Essential to Mastering and proxy it. I point this out cuz I know you don't like getting into a rabbit hole of embedded comps, but it's much faster in the long run and allows reuse of elements. I suspect a lot of your 100-200 layer Composites could be simplified and made more efficient with some nesting. When I render Essential Hitfilm titles the render takes 25 seconds because only the Neon Path animation changes. Everything else is proxied, but there are layers of nests, maybe six deep. But only three shots are proxied. As like... EVERYONE said already, it depends. For my Film Empire episodes, I have a standard project file which I can copy and edit. 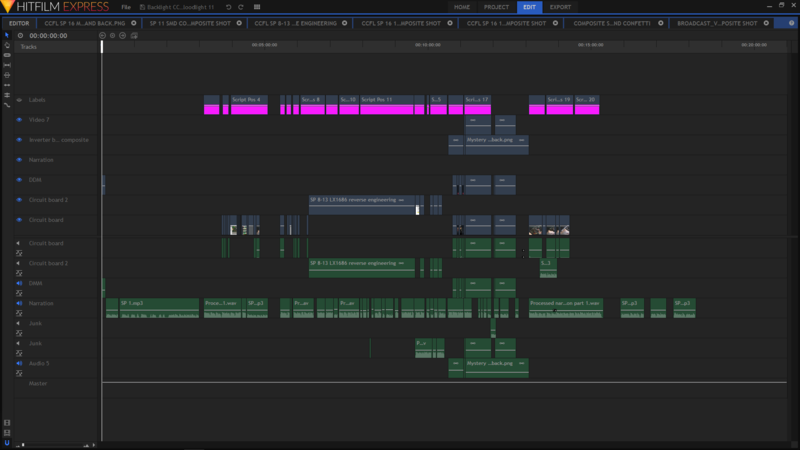 I have 2 footage and 2 audio layers, a Letterbox and 2 layers for motion graphics, and then a music layer. So between 5 and 9 tracks. I label everything, no matter how small or simple. Apparently, I am so stupid that I can't remember even the most obvious use of a track! "I label everything, no matter how small or simple"
@HitfilmSensei labeling tracks is paramount. LCD layout from top to bottom. Video overlay track (maybe not used). Maybe used as a temp test track when trying different clips. A lot of times I timeline trim here since there is normally room to do so. "Scratch" video track. Usually Muted. I store alternate trimmed video clips here when I am trying things out and organizing. I never label the tracks, TBH I had no idea you could, but I still probably wont. I never do anything complex like a "proper film maker" I am a youtube gaming scrub. Generally I start with the main video and audio track at the center and work outwards. Actually if anyone has any advice on the best timeline layout to use I would appreciate it. My setup works decently well but the editing timeline can feel cramped sometimes. @Andy001z I had to search for a while but this might be the one to which you refer. I was pretty sure @Aidin (where you hiding young man? Hope you avoided the worst of Irma) had done something on this topic. Took a while because I'm on the phone not at a screen right now. @tddavis that's the one, well done. I believe @Aidin has been busy on his youtube channel (I get vids pop up oftern) and enjoying the summer break with some travel. Re Irma yes hope many of our Hitfilm community have been safe where ever they might be affected by this major storm. @8Altin8 I am pretty much like you, a gaming scrub, that works pretty much the same way. Start at center and work out. While I knew I could name the tracks it never really dawned on me that I should and after seeing what everyone else is doing I am seeing the benefit of changing my wayward ways.